The world is ready for a great Spider-Man movie. It's been far too long since Tobey Maguire brought the first Spider-Man adventures to the big screen, arguably the best one ever made with 2004's Spider-Man 2. In honor of Spider-Man: Homecoming finally delivering a standout showpiece centered on Marvel's resident wall-crawler held within the actual MCU, let's have a look back at Tobey Maguire's original screen test, shall we? Spoiler alert: it's super weird, violent, and R-rated. 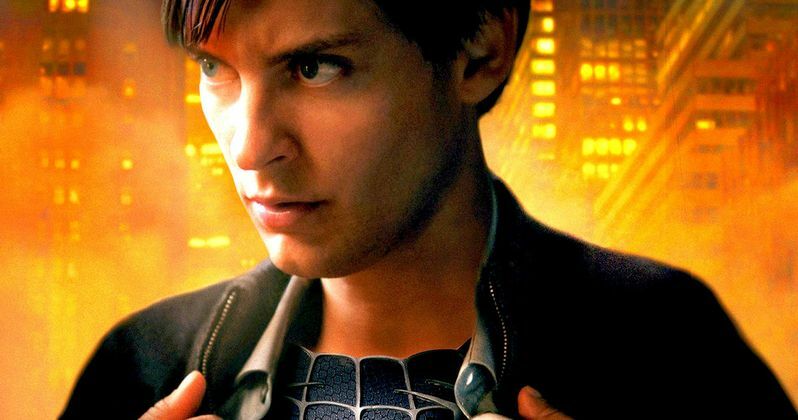 Tobey Maguire's original screen test, which comes to us from YouTube user Matie Matteuucci, reveals a very different kind of Spider-Man. For some reason, there are several F-bombs dropped in the video. Also, since Tobey is just wearing pants and isn't in costume, this kind of winds up looking like a bizarre, kind of bad but in the best way American kung fu movie. Looking at this video, it is a little hard to believe that for the better part of a decade, this was our Peter Parker. And, at least at the time, we loved him for it. Sam Raimi's 2002 Spider-Man movie, which helped usher in the modern era of comic book movies as we know it, was a PG-13 movie, as most superhero movies have been. Only recently with movies like Deadpool and Logan has that trend started to change. So, seeing this bizarrely dark and definitely R-rated screen test is a bit puzzling. Was Spider-Man going to be a bit more edgy at one point? Granted, it's just a screen test, but it raises some interesting questions and shows just how far things developed before the movie actually made its way to theaters. At least until Marvel Studios gives Spider-Man some more screen time, Tobey Maguire is still the on screen gold standard for the character. Andrew Garfield tried his best to act his way out of The Amazing Spider-Man movies, but he couldn't overcome his surroundings. Especially in the case of The Amazing Spider-Man 2, which is the only reason Spider-Man is in the MCU right now. Tom Holland has yet to really prove himself, but his scenes in Captain America: Civil War were more than enough to convince a great may fans that this is the Spidey we've all been waiting for. Still, there are those who will always consider Tobey Maguire to be Peter Parker for his work in Sam Raimi's Spider-Man trilogy. We all just do our best to forget Spider-Man 3. It's not your fault, Tobey. At least not entirely. In total, Tobey Maguire's Spider-Man movies made $2.49 billion at the box office and gave us one of the worst and one of the best superhero movies ever made. His tenure will forever be a mixed bag, but the good outweighs the bad. In the case of this screen test, the delightfully weird outweighs absolutely everything else. But you can't deny that it is 100% pure, unfiltered Sam Raimi. Be sure to check out Tobey Maguire's Spider-Man screen test for yourself below before heading out to see Spider-Man: Homecoming this weekend.